Males have a more red colour during spawning season. Have been bred in captivity, being farmed in their native range and again in public aquaria. In nature they are nest builders in sandy substrate and will guard the eggs and young. Should only be kept with other large fish, lower-swimming than the Arapaima. This fish is highly aggressive and carnivorous. Carnivorous, will eat fish, chopped meat, frogs and crustaceans. Young Arapaima should not be overfed. Some aquarists report that they can develop Drop Eye. The Arapaima needs to swim up to the surface to breath air. This would imply that there needs to be space between the surface of the water and any other fixture. This fish should not be kept by the amateur aquarist unless they truly know what they are getting themselves in for and have a VERY large tank/tropical pond prepared for this fish. A keen and patient hunter, will prey on smaller fish. In the wild they inhabit floodplains in the Amazon, where the waters are low on oxygen, and gulp air from the surface, quite loudly that can be heard from a fair distance away. They have gills but these are often only used while juvenile, once mature they will predominantly breathe from the surface every 15 minutes or so. This is one of the largest known freshwater fish. It is possible for the fish to reach up to 15' (4.5M) in the wild. 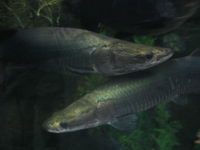 These are large prehistoric-looking fish, with an elongated body, sloping forehead and small head with protruding eyes and large upward-turning mouth. The body is covered with large thick scales, black-grey in colour with blue hints. They have a small rounded tail that is edged with red colouring.